Significance – In the time before cars, Denver was a city with a world-class mass transit system. 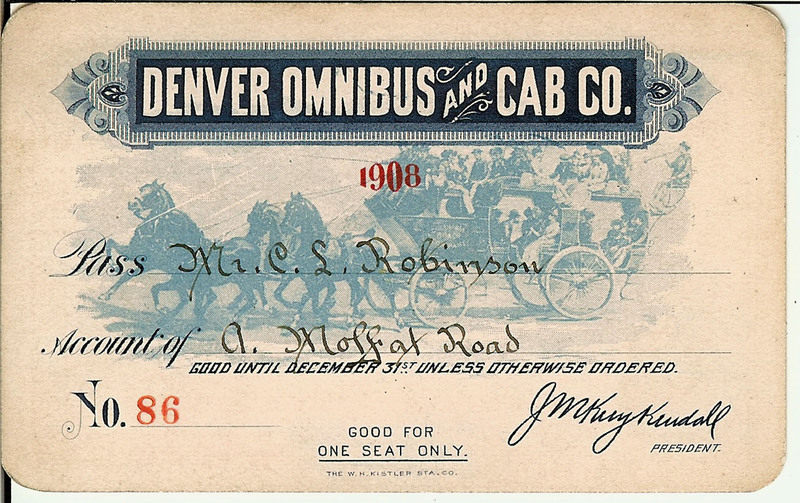 Inscription – By 1886, Denver’s transportation system was becoming more sophisticated with the use of an electric streetcar system. However, by 1887 its use declined and this mode of transport was ultimately abandoned. The electricity was inadequate and sporadic. Also, Denver citizens and mules object to the minor shock they received when they stepped on the third rail. In 1870, Denver was a bustling mining and commerce center with about 4,700 people. The Mile-High City had grown so large that walking from one side to the other time consuming, if a person did not have the luxury of their own coach or horse. 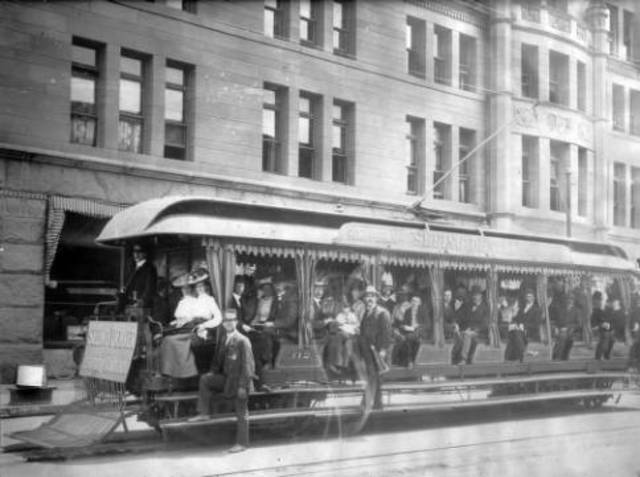 In December, 1871 Denver introduced their first transit line – a horsecar that trotted from Seventh and Larimer to the Five Points neighborhood. Over the next several years, Denver’s mass transit evolved. By 1877, the business – now known as Denver City Railway Company – employed 18 men, had 32 horses and 12 cars. That year they transported a total of 392,420 passengers over its eight miles of road. We don’t know their balance sheet. By 1880, Denver mass transit had expanded modestly, from Broadway at Speer to Larimer at 33rd going north-south, and Federal to Ogden going east- west. The population continued to balloon, growing to 35,000. This predicated the largest single-decade expansion of the Denver Tramway network. In 1886, the system experimented with a direct-current series conduit car system connected to an underground electrified line. It was expensive, complicated and trouble-prone. In wet weather the rails could shock the hooves of horses, pack mules and anyone else who touched the electrified rail. This quickly evolved into a cable-power system, driven by a central powerhouse. Miles of sunken cables moved along next to the tracks, which the cable cars latched onto for propulsion. Additionally, steam engine streetcars were incorporated into the system; one steam line went to the University of Denver campus. The electric street car was so practical that the Denver Tramway decided to electrify all of its cable lines even though they had years of life left in them. By 1890, the population had catapulted to 106,000 and urban development in Denver focused along streetcar lines. Trollies ran the full length of Broadway and Colfax, and the northwest side around Berkeley had multiple routes. These hubs allowed people to walk to their daily needs — stores, schools, the doctor, office space – or take transit to destinations further away. The Denver Tramway Company used 39-foot trolley cars. Most were built by the Woeber Auto Body and Manufacturing Company, though some were built by Denver Tramway. Type 1 cars were built for operation in a single direction, the entrance was on the center of the right side, and the rear of the cars were not completely enclosed. Type 2 cars were built to be reversible so they had controls at both ends and center entrances on both sides. The trolley cars had a distinct appearance, being painted “Coach Painter’s Red” on the main panel, and “Dark Straw” on the lower panels. Unpowered trailers could be pulled behind the trolleys during rush hour in order to carry more riders. In 1915, Denver Tramway commissioned a survey of the mode of transportation people used traveling in and out of the City’s central business district. 51% rode streetcars, 38% walked, 13% drove automobiles, 6% rode bicycles, 1% drove motorcycles, and 1% used horses. Here was the key statistic; compared to 1914, streetcar patronage had dropped by 9% and driving had doubled. The terms of the charter agreement drawn up with the City in 1885 called for a fixed rate fare of 5 cents, and an agreement that the company would contribute 50% of all maintenance costs for roads on which it had a two-way line. As automobile traffic increased, so did the wear and tear on the roads. 1917 saw record ridership of 62 million trips a year – but the Denver Tramway was not able to increase its fares to cover its increased expenses. The Colorado Public Utilities Commission authorized a 2-cent fare increase. The City of Denver sued and in 1919 Dewey C. Bailey was elected mayor on a promise to reinstate the 5-cent fare. The Denver Tramway Company responded with layoffs and pay cuts. By 1928, the number of private automobiles had increased to 78,000 and streetcar ridership declined by 59%. The late 1920s and early ’30s rail routes converted to bus routes. Buses were less expensive to operate and were more flexible, as they were not confined to tracks. More importantly, if Denver Tramways moved away from trolleys it meant the company no longer had an obligation to maintain the streets that it served. At the start of 1949, Denver Tramway had 131 streetcars in service, 138 trolley coaches, and 116 gasoline-powered buses. By the end of 1950 the streetcars were no longer in use and within 5 years most of the infrastructure for them had been removed. During its 78-year run, Denver’s tramway made use of a variety of types of streetcars, including conduit cars (until 1888), cable cars (until 1900), and trolley cars (until 1950). At the height of its trolley operations, the tramway owned more than 160 miles (260 km) of track and operated over 250 streetcars. After World War II when the Denver Tramway Co. switched from streetcars to buses, old trolleys were sold for $100 each. One passenger car has been restored and runs on a short length of track in downtown Denver as the Platte Valley Trolley. 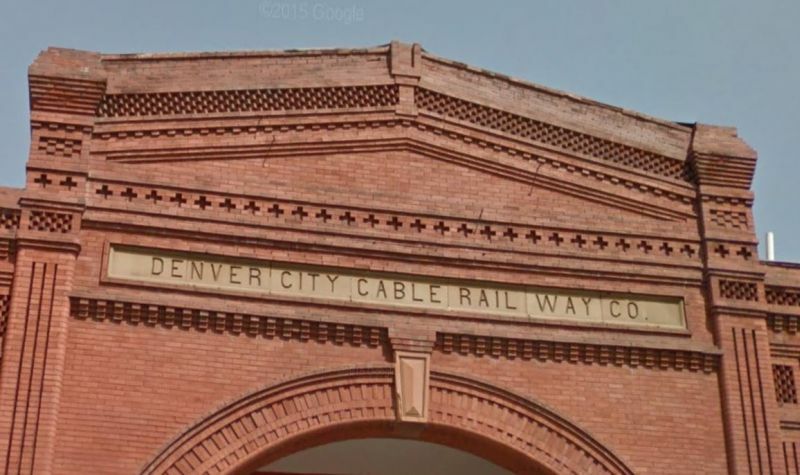 Another car, rests within the former Denver City Cable Railway’s powerhouse at 18th and Lawrence Street. In May 1971, the Denver Tramway Corporation ceased operation of Denver’s transit system, selling its assets and operations to the City and County of Denver. The city continued those operations under the name Denver Metro Transit until 1974, when they were assumed by the voter-approved Regional Transportation District (RTD). How did people get around the early days of Denver? What made the Denver Tramway unique? Why did the electric street car make more sense? Name the biggest drawback to the Denver Tramway system. How did tram lines influence Denver’s city planning?